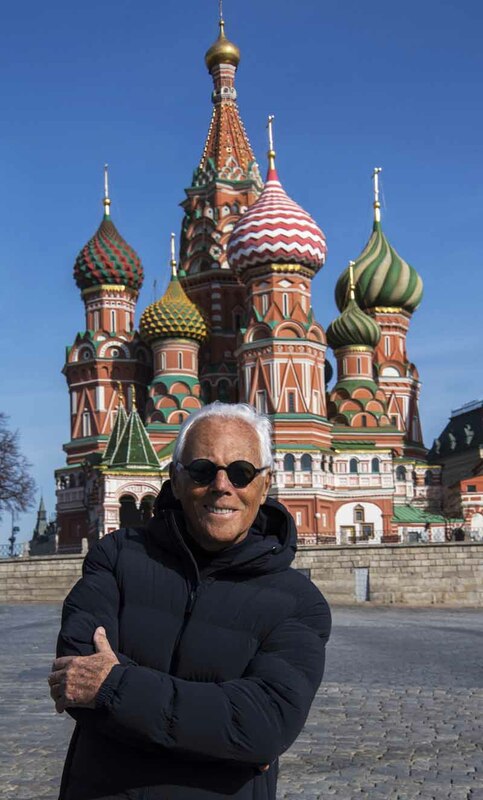 Last week, Giorgio Armani was in Moscow for a series of events to celebrate the presence of the Armani Group in Russia. After his last trip in 2009, the fashion designer returned to the Russian capital to present his book, Giorgio Armani, and his Giorgio Armani men’s and women’s autumn/winter 2016-2017 collections with a fashion show. The first event was held on Wednesday 13th April at the Giorgio Armani boutique in the Tretyakovsky Proezd. In the boutique, opened in March 2015, with a total area of 500 square meters spread over three floors, the designer signed copies of his book, Giorgio Armani. In the book, published by Rizzoli New York and released in September last year, Giorgio Armani chronicles his career in his own words, using the evocative power of images combined with a clear, straightforward narrative. The book signing was followed by an exclusive private dinner. On Thursday 14th April, Giorgio Armani presented his Giorgio Armani men’s and women’s autumn/winter 2016-2017 collections at Tesla 4000, in front of 480 guests including celebrities, socialites, dignitaries and the press. The fashion show was followed by an after-party.